It has been 3 months since my last update (slack, I know!!) so there is a lot to tell you! Locally (in Basel) I have had the pleasure of hosting a new event in Basel called the 'Landestelle Acoustic Nights', they have been so fun to play and if you have been to that area you will know that the location is fantastic. Aside from a few local shows and the Acoustic Nights I have been abroad a lot! I have played in Germany Luxembourg and Spain. All of the shows have been fantastic and as always, there have been a tonne of new people to meet and many fantastic musicians to play with. I have also discovered what may possibly be the best acoustic guitar shop in Switzerland. The team at 'Urs Winkler Guitar Repairs' did the best refretting and set up I've had the pleasure of experiencing, not to mention they had one of the most exquisite acoustic guitar collections I have ever seen. I would highly recommend these guys!! Two big highlights worth mentioning would be performing at the 'Estavayer Le Lac Swing In The Wind Jazz Festival'. This was awesome! The atmosphere and location were just incredible, not to mention the amazing Biréli Lagréne played there as well (if you don't know him, please look him up!). The other highlight was a 10 day tour of Spain. 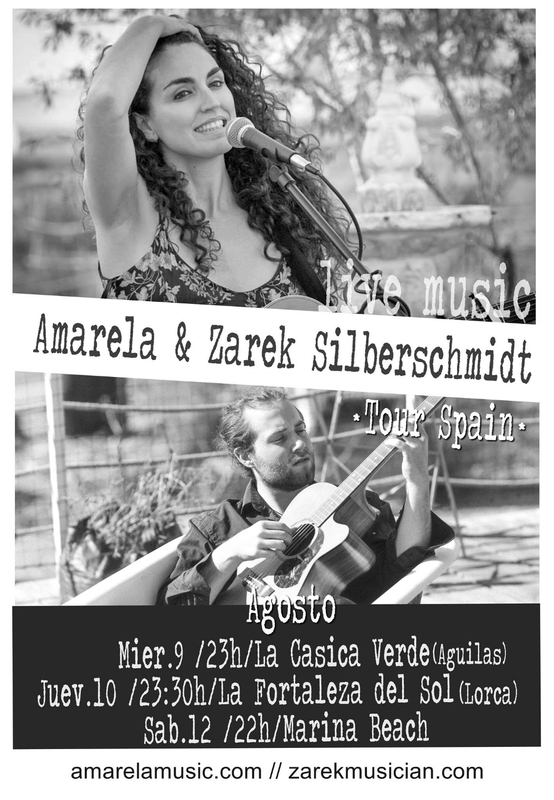 I performed alongside the Spain artist 'Amarlea' for 4 shows in Murcia and Aguilas. Once of the concerts was in an open air castle.. Happy with that!! So, now that you are all up to speed here is a little of whats to come! I head into the recording studio next week to work on my first E.P! I have been booked for a Switzerland based festival of Architecture and Contemporary music and a big tour is coming together for January and February next year with a very special guest.. But more of that to come soon. Entertaining the people of Waldkirch! Poster for the tour of Spain! Landestelle Acoustic Nights in action! This is a great moment captured during a show in Darmstadt, Germany. September & October, you beauty!